Wise Man's Grandchild (賢者の孫, Kenja no Mago, lit. "The Sage's Grandson") is a Japanese light novel series written by Tsuyoshi Yoshioka and illustrated by Seiji Kikuchi. It began serialization online in January 2015 on the user-generated novel publishing website Shōsetsuka ni Narō. It was acquired by Enterbrain, who have published nine volumes since July 2015 under their Famitsu Bunko imprint. A manga adaptation written by Yoshioka and illustrated by Shunsuke Ogata began serialization on Kadokawa Shoten's Young Ace Up website from March 2016. It has been collected in nine tankōbon volumes. An anime television series adaptation by Silver Link premiered on April 10, 2019. Tsuyoshi Yoshioka originally started the series as a web novel. The series was acquired for print publication by Enterbrain, who published the first light novel on July 30, 2015. A manga adaptation, written by Tsuyoshi Yoshioka and illustrated by Shunsuke Ogata began serialization on Kadokawa Shoten's Young Ace Up website since March 2016. 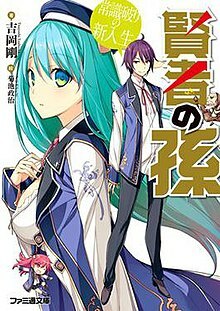 Nine tankōbon volumes have been released as of December 29, 2018. An anime adaptation of the series was announced in September 2017. The anime, which was later confirmed to air on television, is directed by Masafumi Tamura and written by Tatsuya Takahashi, featuring animation by Silver Link with character designs by Yuki Sawairi and music by Kow Otani. The series premiered on April 10, 2019 on AT-X, ABC, Tokyo MX and BS11. i☆Ris will perform the series' opening theme song "Ultimate☆Magic", while Nanami Yoshi will perform the series' ending theme song "Attōteki Vivid Days." Funimation has licensed the series, and produces a dub as it airs. ^ "[Master Thread] Wise Man's Grandchild". www.funimation.com. Retrieved 2019-04-09. ^ a b c "Kenja no Mago TV Anime Reveals Main Staff, Visual, April 2019 Premiere". Anime News Network. September 20, 2018. Retrieved September 20, 2018. ^ a b c d e "[Master Thread] Wise Man's Grandchild". www.funimation.com. Retrieved 2019-04-11. ^ a b c d e "Kenja no Mago Anime's Teaser Video Reveals Opening Artist, 5 More Cast Members". Anime News Network. December 20, 2018. Retrieved December 20, 2018. ^ "Kenja no Mago Anime Casts Toshiyuki Morikawa". Anime News Network. February 5, 2019. Retrieved February 5, 2019. ^ a b c d e f g h i "Kenja no Mago Anime Reveals More Cast, April 10 Debut, New Visual". Anime News Network. February 25, 2019. Retrieved February 25, 2019. ^ "賢者の孫". Shōsetsuka ni Narō (in Japanese). Retrieved October 21, 2018. ^ "賢者の孫 常識破りの新入生". Enterbrain. Retrieved October 21, 2018. ^ "賢者の孫2　破天荒な新英雄". Enterbrain. Retrieved October 21, 2018. ^ "賢者の孫3　史上最強の魔法師集団". Enterbrain. Retrieved October 21, 2018. ^ "賢者の孫4　天下無双の魔王降臨". Enterbrain. Retrieved October 21, 2018. ^ "賢者の孫5　狂瀾怒濤の三国会談". Enterbrain. Retrieved October 21, 2018. ^ "賢者の孫6　英姿颯爽の神使降誕". Enterbrain. Retrieved October 21, 2018. ^ "賢者の孫7　豪勇無双の英雄再臨". Enterbrain. Retrieved October 21, 2018. ^ "賢者の孫8　遊嬉宴楽の英雄生誕祭". Kadokawa Shoten. Retrieved February 27, 2019. ^ "賢者の孫9　驚天動地の魔人襲来". Kadokawa Shoten. Retrieved February 27, 2019. ^ "賢者の孫". Young Ace Up (in Japanese). Retrieved February 25, 2019. ^ a b "Kenja no Mago Fantasy Novels Get Anime". Anime News Network. September 22, 2017. Retrieved September 22, 2017. ^ "賢者の孫　（１）". Kadokawa Shoten (in Japanese). Retrieved February 25, 2019. ^ "賢者の孫　（２）". Kadokawa Shoten (in Japanese). Retrieved February 25, 2019. ^ "賢者の孫　（３）". Kadokawa Shoten (in Japanese). Retrieved February 25, 2019. ^ "賢者の孫　（４）". Kadokawa Shoten (in Japanese). Retrieved February 25, 2019. ^ "賢者の孫　（５）". Kadokawa Shoten (in Japanese). Retrieved February 25, 2019. ^ "賢者の孫　（６）". Kadokawa Shoten (in Japanese). Retrieved February 25, 2019. ^ "賢者の孫　（７）". Kadokawa Shoten (in Japanese). Retrieved February 25, 2019. ^ "賢者の孫　（８）". Kadokawa Shoten (in Japanese). Retrieved February 25, 2019. ^ "賢者の孫　（９）". Kadokawa Shoten (in Japanese). Retrieved February 25, 2019. ^ "『賢者の孫』小松昌平さん・本泉莉奈さんら追加声優＆ティザーPV解禁！OPテーマはi☆Risが担当". Animate Times (in Japanese). December 12, 2018. Retrieved February 25, 2019. ^ "Kenja no Mago Anime's Promo Video Previews Both Opening, Ending Themes". Anime News Network. March 2, 2019. Retrieved March 2, 2019. ^ "Funimation to Stream Isekai Quartet, New Strike Witches, Helpful Fox Senko-san, Wise Man's Grandchild Anime". Anime News Network. Retrieved 2019-04-09. This page was last edited on 20 April 2019, at 10:17 (UTC).